sitting in the garden and I felt God say 'feed my sheep.'" The particular garden she was sitting in was a beautiful one. She tended it while she a student at Legacy School of Discipleship during the spring of 2010. It was at that moment in the garden when she began to pursue that calling to the best of her ability. This led her to switch her majors at Auburn and begin classes in Fruit and Vegetable Production. was only interested in the trees with medicinal value or food value. After taking that class, I knew I wanted to grow food." That is when he switched majors to Fruit and Vegetable Production and et Morgan. "She caught my eye from day 1." After meeting in class, Taylor asked Morgan if she needed a study buddy for an upcoming test and she accepted. That was in the fall of 2010. "I met my future bride and Auburn won the national championship in football. Probably the best fall of my life." The following spring, Taylor followed in Morgan's footsteps and attended Legacy. "That season was amazing. One that is still shaping me today." There, he worked in the same garden that Morgan tended, pruned vineyards, and helped out as he could with work around the farm. 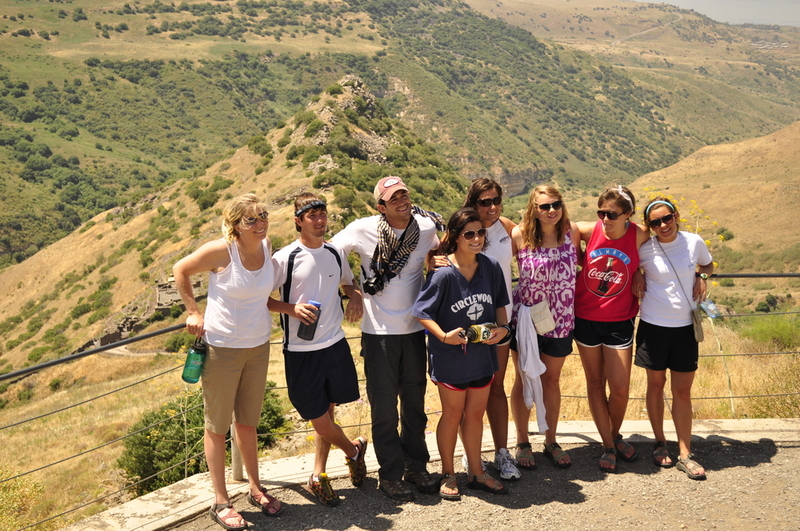 Taylor with the Legacy class of 2011 in Israel. He is on the top row, 4th from the right. opportunity to work at Scott River Lodge in the beautiful Scott Valley of Northern California. While there, he worked with the landscaping team, but in his spare time he would walk up to the 3 acre garden and dream about farming. During the time Taylor was away, Morgan found community and family in Auburn. "Coming back to Auburn after Legacy, I was thirsting for community. The Lord provided by bringing Mr. Larry and the carpenter shop into her life. On sundays, an assortment of people would come together to worship, testify, pray, and hear 74 year old Mr. Larry encourage the group. Any given sunday, one would find men and women from India, Central America, South Africa; the rich, the poor, white black, young and old. For Morgan, this was the Church, and these people laughed, prayed, cried, and celebrated with her as she finished college. They also gardened with her. Mr. Larry had a half acre garden where he grew vegetables that would be harvested and made available to those in need. She spent many mornings and afternoons with Mr. Larry planting, weeding, and harvesting. "I learned a lot from him. And much more than just about growing vegetables. He taught me what it means to believe." Men and Women from the Carpenter shop working in the garden. Fruits from the labor of Love. and officially made her his bride on May 19, 2012. While Morgan finished school, Taylor worked with Young's plant farm and gained valuable experience working both in the greenhouses and the warehouses. In 2013 Morgan and Taylor had the opportunity to return to Scott River Lodge to be managers of the Farmstead. During their time at the lodge, they operated the 3 acre garden, the chicken broiler and egg layer operation, and tended to the farms horses and goats. From these efforts, they provided CSA shares for locals in the valley and provided as much fresh produce, eggs and chicken for the Chef in the lodge as possible. Morgan prepping the ground at The Farmstead. Taylor in the middle of a cover crop working on the irrigation lines. Taylor and Morgan in the garden at the Lodge in 2013. The one and only, Scott Valley. Scott Valley with Mt. Shasta in the background. valley is truly one of the most beautiful places on earth, full of wildlife and adventure. The opportunity to return in 2014 as full-time staff was too great to pass up. But the Lord had other plans. In late September, Morgan and Taylor found out they were having a baby. After much prayer and consideration, they decided to return home to be closer to family. It was then that the search for a place to grow food and a place to grow a family began. In January of 2014, their search brought them to Bill Johnson's place which he affectionately calls "Trail's End Ranch". Mr. Bill, a family friend of over 50 years, had transformed the property. He had cleared fence rows and pastures, built infrastructures like a livestock barn and a pole barn, restored a barn dating back to the 19th century and fully restored cedar cabin dating back to the 1830's. While here, he has raised numerous animals including goats, horses, cows, and kept a couple donkeys. His love for history, wildlife, are nature are evident. When given the opportunity to farm and continue working the land on this property, Morgan and Taylor jumped on it. "Jackson", one of Mr. Bill's many animals he raised while running Trails End Ranch. Restored 19th century dairy barn. Starting in the spring of 2014 Taylor began getting the ground ready. Because of their commitment to grow food in a sustainable and organic way, Taylor dedicated all of 2014 to growing cover crops on the garden site. This added organic matter to the soil and helped alleviate weed pressure by outcompeting problematic grasses. Breaking ground for the first time. Taylor in a stand of Sudangrass and Copweas. infrastructure, Taylor and Morgan were ready to harvest the fruit of their labor. Beginning in the spring of 2015, RiverFly Farms became a vendor at the Greene Street Market in downtown Huntsville. "We really fell in love with the people and the community surrounding the market." Morgan said, "The customers are fantastic and the camaraderie between vendors is fun to be a part of. The experience we gained in our 1st full year growing and selling in Alabama is so valuable. We learned a lot about ourselves, our farm, and most importantly, our customers." Red Russian Kale starts ready to be planted in the garden. Lettuces right after transplanting out. The bounty on display and for sale. Following their calling and their dreams have led them here. To find out where they are going next click here.